US special envoy recalls how PA firefighters helped battle blazes in Israel in 2010 and 2016 while blasting Hamas for arson terror in south. US Special Envoy to the Middle East Jason Greenblatt slammed the Hamas terrorist organization for its terrorist arson in southern Israel and said that firefighting had previously been a cause that brought Israelis and Palestinian Arabs together. In an op ed published on the CNN website, Greenblatt recalled how Palestinian Authority firefighters joined Israel's battle to extinguish the deadly 2010 Karmel forest fire and the November 2016 fires that raged across central Israel. "During Hanukah 2010, a fire raged for 77 hours in northern Israel, consuming thousands of acres, endangering hundreds of lives and ultimately killing 44 people. Local Israeli firefighters in the region struggled to slow the spread of this historic fire. Israel's Palestinian neighbors -- from Bethlehem, Jenin and Ramallah -- saw the emergency in northern Israel and offered their help," Greenblatt wrote. "Four fully equipped firetrucks with 19 trained Palestinian firefighters joined to face the deadly fire. These Palestinians, alongside their Israeli neighbors, held the line against the raging flames. Together (and with the help of 17 countries) they brought the fire under control and prevented further devastation. Greenblatt said that this show of solidarity to save the land both sides have shed so much blood over offers "a glimpse of what could one day be -- and, frankly, what should be" when peace is achieved. 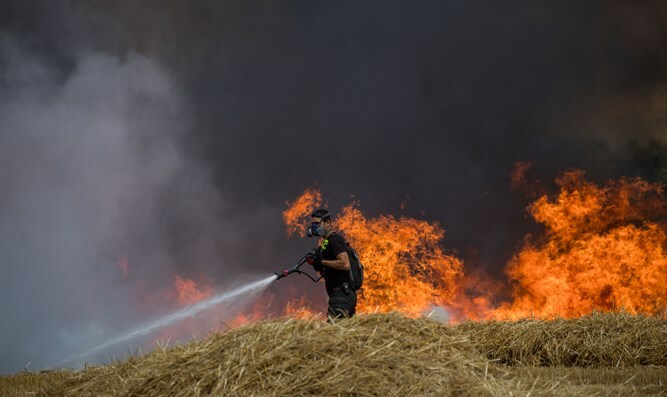 Having observed the cooperation between Israel and PA firefighters, Greenblatt sadly noted Hamas' latest tactic of attaching burning and incendiary devices to kites and balloons sent over the Gaza-Israel border to burn as much land as possible. "Already, Hamas' new weapons of choice have burned thousands of acres of land and caused millions of dollars of damage in southern Israel. On the other side of the border, their Israeli neighbors keep watch for incoming kites and rush to extinguish fires caused by toys that once symbolized joy. "Hamas' intent is to cause as much damage to Israel as possible. But much like the indiscriminate destruction that their fires cause, Hamas has no regard for the widespread harm they are doing to Palestinians in Gaza. While Hamas focuses on violence toward their Israeli neighbors, they have neglected and utterly failed to build the infrastructure and systems to make life better in Gaza. The US envoy said that while he and the Trump Administration continue to work on their peace plan for the region, the people of Gaza must choose between cooperation with Israel and a better life, or the may of Hamas which has brought them only misery. "Imagine a region where Israelis and Palestinians work together to not only fight fires, but to build a better future for their respective people. My colleagues and I on the US peace team are driven by this vision. We believe that respect and cooperation between the two sides could lead to so many advancements and to a better life for all."